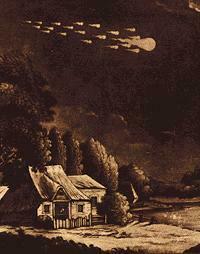 The Fireball of August 18, 1873, near Newark-on-Trent, England. Etching by Henry Robinson. There are many different ways to collect meteorites and many different types of specimens. One of the keys to enjoying the hobby and to appreciate the scientific aspect of the hobby is to understand what is available to the collector. On this page is an explanation of the various kinds (in terms of physical characteristics) of meteorites one might collect. Collector preference rules in the meteorite collecting world. In other words, you "should" collect whatever you prefer to collect. Keep in mind though that some meteorites may be very difficult or impossible to collect in one or another form. For example, only a single specimen of Claxton is known to exist, and this piece has been fragmented and sliced up for museums and collectors. Obviously, this piece is not available to the collector as a "whole individual". Perhaps the most basic type of specimen to collect is the whole individual. As the name implies, this is simply a whole meteorite. One that has not been cut or broken. Fusion crust may be present to varying degrees (usually expressed as a percentage (e.g., 50%, 90%, 99%, 100%). Whole individuals may range from a few grams (Holbrook comes to mind) to several scores of Kilograms (Gibeon or Canyon Diablo). A meteorite slice is like taking a loaf of bread and slicing it into separate, flat-surfaced pieces. It is literally a sawed slice from an individual meteorite. However, the slice may be a complete slice, in which case the perimeter of the slice is the actual exterior of the original meteorite, or it may be a part slice, in which case the slice contains one or more "straight cuts" from sawing. Alternatively, the slice may be from completely within the interior of the meteorite and thus the edge or perimeter of the slice will contain no fusion crust. Slices are usually polished one one or both sides which is done to more readily reveal the internal nature, such as chondrules or unclusions, of the meteorite. Slices of iron meteorites, in addition to being polished, may also be etched with acid to reveal Widmanstatten patterns or Neuman line, if present. Fragments are neither whole individuals nor slices. Imagine taking a whole individual and beating it with an hammer. What do you get? Fragments! Fusion crust may or may not be present. Fragments are generally not polished but one usually finds chondrules that protrude out from the background matrix. Imagine the "loaf of bread" example I used to describe a slice. True to the analogy, an endpiece is one of the two ends. One "side" is the outer part of the meteorite and the other sawed "side" is usually a polished face. As with a whole individual, fusion crust may be present to varying degrees. They are easy to store and display in a protective specimen case. They are not bulky and are easy to handle. One can acquire a very nice collection at minimal cost. One can readily see that a micromount may be a whole individual, a slice or part slice, a fragment, or even an endpiece! Which type of meteorite is right for you? Whatever you like. Many collectors have a variety of different types.